HVAC air quality monitoring market is bifurcated into portable and stationary products. Stationary segment holds the largest share and is projected to cross USD 3.5 billion by the end of forecast time period. 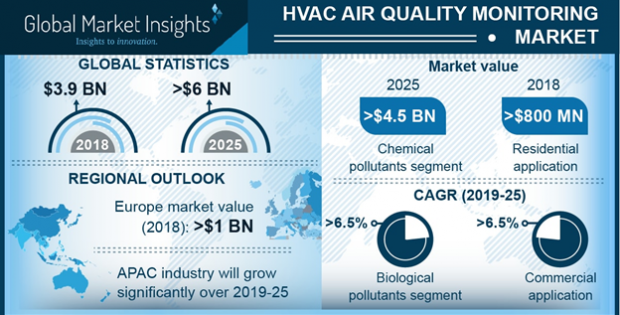 HVAC Air Quality Monitoring Market size will likely surpass USD 6 billion by 2025; according to a new research report by Global Market Insights, Inc. Rising public awareness related to indoor air pollution along with implementation of effective regulations for analyzing and monitoring the indoor air quality all across the globe are the main reasons bolstering the demand for HVAC air quality monitoring products. Other factors such as increasing funding and investments for extensive research activities to develop effective products to monitor various types of pollutants will further help in giving an up thrust to the overall HVAC air quality monitoring market growth. According to Environmental Protection Agency (US-EPA), an average U.S. citizen spends around 90% of their life indoors, either in homes, offices, or shopping malls. This makes indoor air quality a prominent factor as it affects the comfort, health and productivity of inhabitants of a building. With alarming global pollution levels, indoor air quality control systems will prove essential to keep the harmful effects outside the buildings. These products are also important in various industries such as oil and gas, where majority of the processes include combustible and toxic materials. Air quality monitoring systems are used for examining such toxic gases and materials in ventilation ducts and air conditioning shafts of refineries and in living quarters of offshore rigs, thus preventing loss of lives and capital. With stringent industry regulations and rising popularity of smart homes, the demand for HVAC air quality monitoring products is expected to rise in industrial and residential sectors in near future. Although some factors such as high product setup and maintenance cost, and lack of public awareness in developing nations can hinder the market growth rate over forecast timeframe. HVAC air quality monitors market for chemical pollutants will surpass USD 4.5 billion by 2025, dominating the overall market. This is due to the excessive presence of chemical pollutants such as carbon dioxide, carbon monoxides, formaldehydes, VOCs (volatile organic compounds), ozone, etc. in the vicinity of residential, commercial, institutional, and industrial buildings. The commercial application sector will witness a substantial growth rate of more than 6.5% from 2019 to 2025. Most of the commercial buildings such as offices, hotels, shopping complexes, malls, etc. are now focusing more on health and comfort of the occupants, hence propelling the demand for air quality monitors. Furthermore, governments of various developed nations have made it mandatory to regularly inspect air quality and install such products in commercial and institutional buildings. Asia Pacific is expected to show high growth in HVAC air quality monitoring market owing to factors such as emphasis of regional government on curbing the problems arising from industrial pollution and slowly shifting focus towards checking the quality of ambient air. Various environmental laws have also been enforced in the emerging nations of the region, which will boost the product demand in coming years. The key HVAC air quality monitoring market players include Honeywell International, Siemens, 3M, TSI Incorporated, Emerson Electric, Thermo Fisher, Testo, Aeroqual, Rave Innovations, Forbix Semicon, Air Monitors, and Oizom Instruments.